The ace investor Rakesh Jhunjhunwala recently celebrated his birthday on 5th July 2017. He turned 57 years old now. Rakesh Jhunjhunwala started his stock market investment journey with Rs.5000 in 1985. Today his portfolio worth is 2.4 Billon USD. He manages his own portfolio as a partner in his asset management firm, Rare Enterprises. He is a self-made billionaire and also known as a Warren Buffett of India. He spent his entire life in stock market investment and trading. Rakesh Jhunjhunwala is a mastermind in picking multibagger stocks at an early stage. Rakesh Jhunjhunwala’s tips and advice is followed by many investors blindly. 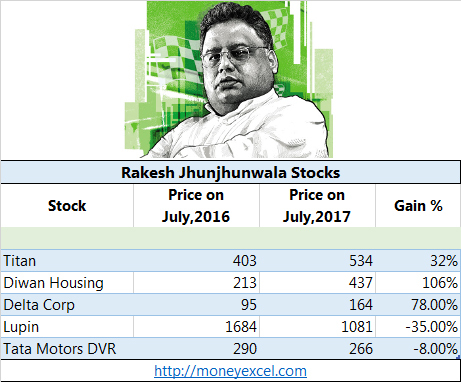 As a part of his birthday celebration, let us discuss few stocks for Rakesh Jhunjhunwala. Titan, Dewan Housing Finance Corporation, Delta Corp, Lupin & Tata Motors DVR are few stocks from Rakesh Jhunjhunwala portfolio. Among these Titan and Lupin are favorite stocks of RJ. The performance of Lupin last year was not so good. However, the overall performance of these stocks since purchase is very good. RJ is holding Titan stock since 2002-2003. He bought Titan at the average price of 5 Rs. As of now, stock price of Titan is Rs.532. Overall CAGR return of this stock from 2002 to 2017 is 37%. Last year this stock could able to give 32% CAGR return to the investor. It is estimated that Titan stock has increased 10680 times in past 15 years. It clearly indicates that long-term investment in stock pays good returns. Jhunjhunwala is holding Dewan Housing Finance since past four years. He purchased stock with an average price of Rs.135. As of now, stock price of Dewan Housing Finance is Rs.438. In last year stock has given 106% CAGR return to the investor. Delta Corp is another stock of Rakesh Jhunjhunwala. RJ is holding this stock since unknown years. Delta Corp historical performance is very good. Last year this stock has given 78% return to the Investor. Next stock of Rakesh Jhunjhunwala is Lupin. This stock was purchased by Jhunjhunwala several years back at the price of Rs.150. Last year this stock could not perform. Recently Jhunjhunwala has reduced stack from Lupin. It indicates you need to make appropriate changes in portfolio time to time based on stock performance. Tata Motors DVR is next stock holding of Jhunjhunwala. Tata Motors DVR was also underperformer stock last year. There was even news of reducing stack in this stock by Rakesh Jhunjhunwala. First learning from Rakesh Jhunjhunwala stocks is buy a small cap stocks with potential to become large cap. All stocks mentioned above are purchased by Rakesh Jhunjhunwala when it was small cap stocks. It is a difficult task to identify such stocks. However, you need to be master in this task if you want to generate wealth from stock market. Second learning from above stock is buy right stock and hold it for longer duration. Jhunjhunwala is holding stocks like Titan and Lupin since several years. Long term investment in stock is likely to give you better returns. Third valuable learning from Rakesh Jhunjhunwala stocks is one should make changes in portfolio as and when required. One should know when to exit from stock or book profit. An example is stock of Lupin, where RJ recently booked profit. After reduction of his stock, it is seen that stock price is reduced considerably. You should invest in company with competitive advantage and strong management. Delta Corp is example. It is unique company holding offshore gaming license and running online portal of casino. This company has competitive advantage over others. Do you think learning mentioned over here will be helpful to you? Do share your views?